On a breezy, cloudless Tuesday in mid-​August, I accompany Barry Harris to one of his bee yards. 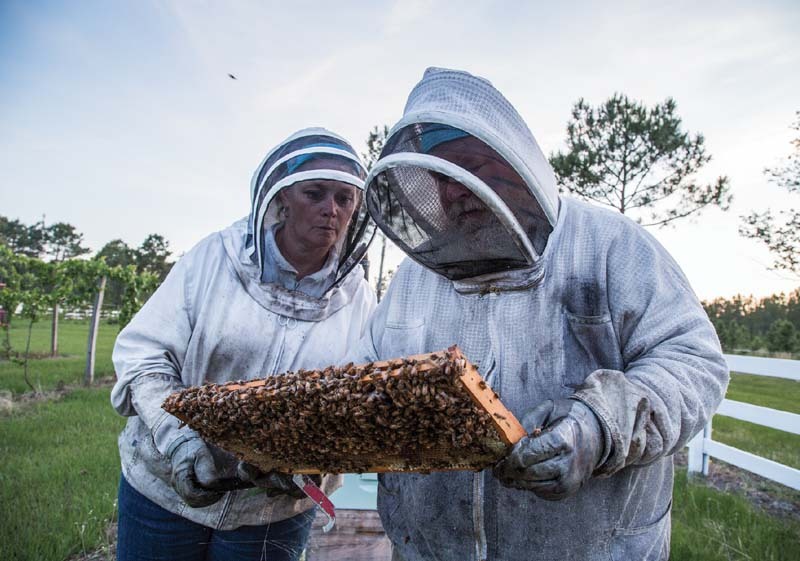 He and his wife, Jill, who own Silver Spoon Apiaries, a bee-​keeping company in eastern North Carolina, run nearly a dozen bee yards between Brunswick and Pender counties, a range of about a hundred miles. They spend lots of time on the road. Most of the yards are home to between twenty and sixty hives, but the largest can hold 225. The one we’re visiting today supports about half a million bees. 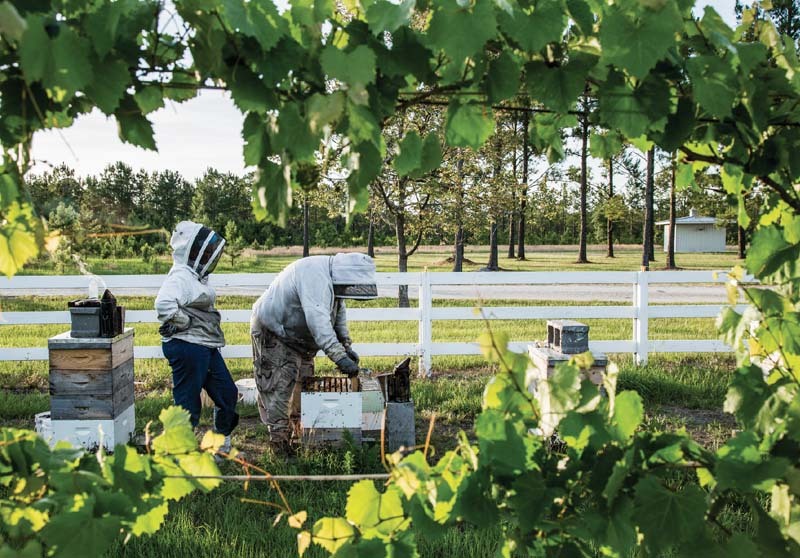 Barry and his wife will be pulling honey—​“and in a hurry,” he told me, since they are three to four weeks behind, and the honey season is a limited window. He agreed to let me come watch under the condition that I keep my mouth shut; there is too much work for him to do and talk to me at the same time. I can watch now and, if I’m lucky, ask questions later. I have not yet considered that my questions might be the wrong ones. Barry is a big guy, built like a boulder, about as tall as I am at six feet but possibly twice my 150 pounds. He has a wild beard the color of snow and gravel. 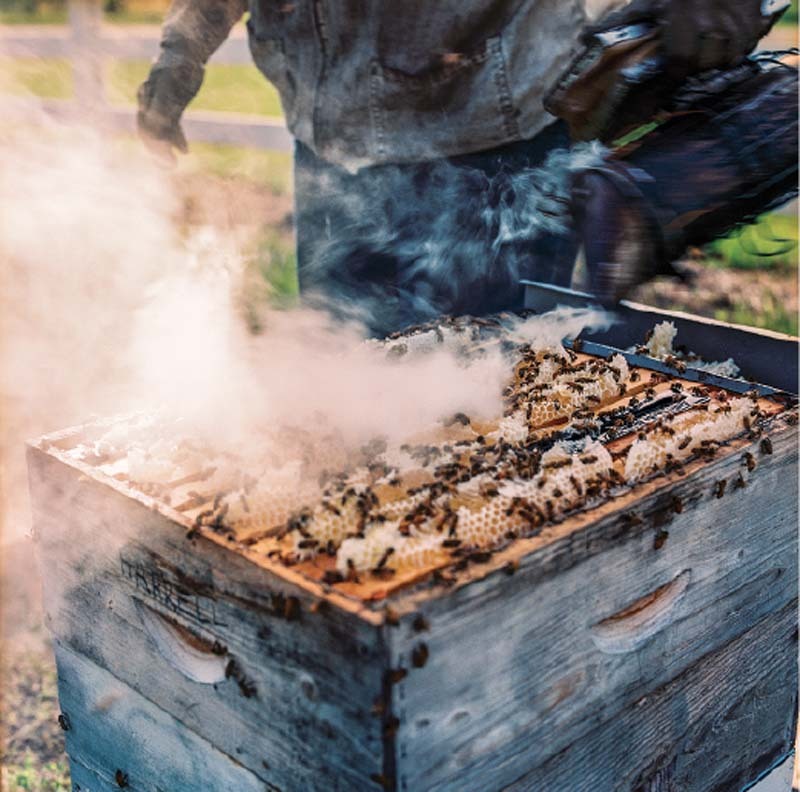 In the past nine years, he is the only person in North Carolina to be certified as a Master Craftsman Beekeeper, the highest level of achievement in the local master bee-​keeping program, which is the largest of its kind in the country. Today he wears military fatigue cargo pants with a matching belt, Wolverine boots, and a protective canvas jacket and head cover that on him looks like an oversized hooded sweatshirt. This particular bee yard is just southwest of Ogden Elementary, past immaculately pastoral subdivisions and at the end of a long, forking driveway that splits every thirty yards or so onto a private residence set well back into the greenery. To get there, I follow Barry onto one of the last forks, which opens up onto a small field, at the far end of which I recognize what must be the beehives, though they look only like stacks of file cabinets. I had pictured a hollow enclave in the middle of a forest, but here we are near the coast: Abutting the tree-​ringed field is an embankment that leads to the waterline, a nameless offshoot of the Atlantic Intracoastal Waterway. Barry steers his truck across the field and pulls to a stop under the trees. Jill’s truck, with a Confederate flag in the license-​plate holder, is already parked. I continue straight ahead slowly, thinking I’ll park off to the side instead of planting my car in the middle of his workspace. This is the wrong decision. Barry stomps out of his truck shaking his head, and points behind me toward the road. “You need to reverse out exactly the way you came, and follow right behind me in my tracks,” he commands. “Right in my tracks.” I do what I am told. “Get him set up,” he tells his wife, and disappears to the other side of the hives. I am here because, at a farmers’ market a week earlier, I found locally made honey in jars that promised “pure & natural” sweetener from Wildflower Julie’s Bees. I don’t eat much honey, but it seemed useful to have in my cupboards, for tea, and I remembered that a friend of mine, who teaches high-​school science, had told me once that locally made honey is helpful for seasonal allergies. That I was buying from a local market felt responsible. I wondered about the farmers whose crops were being sold: where their farms were located, how big their operations were, how they were doing financially. I realized I didn’t know anything about bees, though I’d met three people in the last two months who were raising bees in their backyards, which was more than I’d met in the twenty years before. Curious, I called the phone number on the jar of Wildflower Julie’s Bees, but the line didn’t ring, just sent me directly to an answering machine with a robotic voice. I left a message. So I would have an idea of what to ask when they called back, I began to learn about honey bees. There are, I discovered, many types. Several are native to Europe: the German bee, the Italian bee, the Russian bee. A few come from Africa. Others have been bred by scientists. Some of these, like the Midnight or the Starline, sound wistful and romantic, like cruise ships. Others sound like vaccinations—​the Minnesota Hygienic, the Double Hybrid. Honey bees are the most important pollinators in the United States. They pollinate nearly two hundred cultivated crops and flowers and a third of our food supply, at an estimated value of $15 billion. In North Carolina, one of seventeen states where the honey bee is the official state insect, honey bees pollinate strawberries, blueberries, blackberries, cucumbers, melons, peaches, pumpkins, squash, apples, watermelons, cotton, peanuts, and soybeans. A single hive, which can number as many as 60,000 bees, can pollinate ten times as many flowers in a single day. Facing peril, or overcrowding, a portion of the hive can swarm—​depart the nest and colonize a new location. They can forage for nectar over an area of more than a thousand acres. They can fly as fast as fifteen miles an hour. In her lifetime, which is typically about six weeks in the summer season, a worker bee can fly 500 miles, or the distance between Wilmington, North Carolina, and Philadelphia. In flight, her wings beat about 250 times each second, or so many hertz—​on a musical scale, this vibration frequency corresponds to a B note. When I didn’t hear anything back from Wildflower Julie, I went looking for someone else to talk to. At the North Carolina Department of Agriculture & Consumer Services, I found a list of dealers with current permits to sell bees in North Carolina. Two were located in Wilmington. One of them was Silver Spoon Apiaries, Inc.
“One thing you need to keep in mind,” Barry told me when I called him, “is that ninety-​nine percent of the so-​called beekeepers are hobby beekeepers. 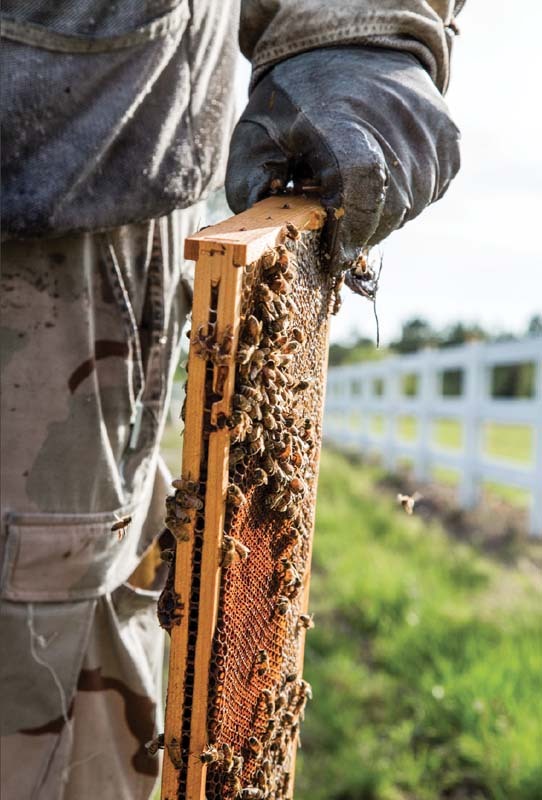 In North Carolina there are thousands of hobby beekeepers. And there are less than ten commercial beekeepers. There’s a public misconception that a beekeeper’s a beekeeper’s a beekeeper. But the difference between a hobby beekeeper and a commercial beekeeper is like the difference between someone with an aquarium in his living room and somebody that owns three oceangoing deep-​sea vessels.” I had reached him in his truck. Earlier that morning, Jill had recommended I try him between three and five in the afternoon, when Barry would be on the road. When he’s not on the road, she said, he’s working, and he can’t talk then. Barry spoke in formidable gusts, so I had a hard time intervening with a question. He explained that there are three ways a commercial beekeeper can do business: pollination, honey production, or the sale of bees and equipment. 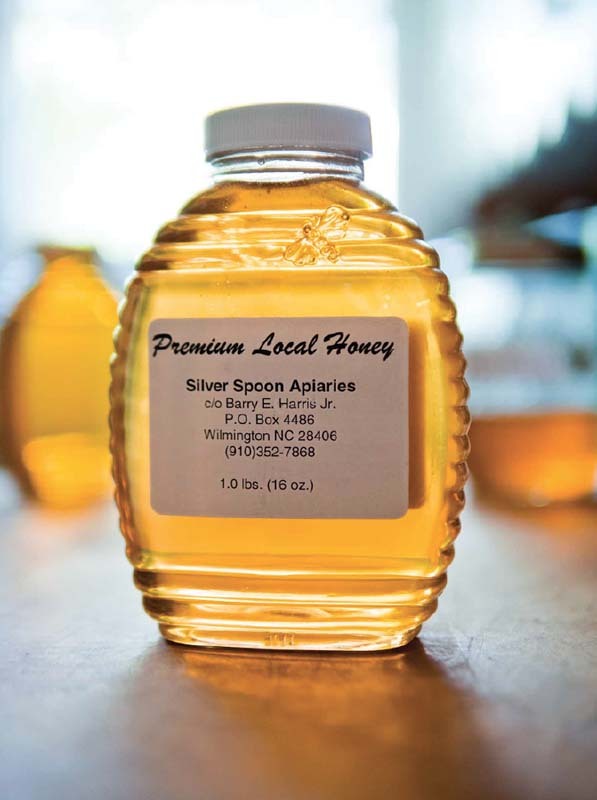 Silver Spoon Apiaries mostly sells honey, though about a quarter of its revenue comes from selling to hobbyists. Only a fraction of what Barry was saying related to my initial curiosity about the dangers facing honey bees, but I expected that if I could meet him in person I’d be able to get more answers. I asked if he would let me come watch him work one day. Fine, he said. I should call him Tuesday, when he’ll be headed to one of his bee yards in Ogden. On Tuesday, once we’re beyond the forking driveway and I’ve reparked my car, Jill hands me some protective gear she says likely won’t fit, but is better than nothing: an XXL canvas jacket with 1-​800-​beeswax embroidered on the front and a child-​sized head cover that looks like a fencer’s helmet. “You probably want to roll up your windows,” she warns. The hives are in nine stacks of what look close-​up like dresser drawers, each with a cinderblock on top and suspended off the grass by a couple of four-​by-​fours. The shortest stack is just one drawer; the tallest is five. The drawers are called supers, Barry lets me know, “French for above, meaning the box that goes above where the bees are.” Jill tells me to stand behind the stacks, across from her and Barry; they’re going to be blowing the bees downwind out of the supers, and I don’t want to be in the path when they do. Barry has a bellows the size of his forearm, inside of which smolders a handful of dry pine needles. He starts by whooshing smoke into the top super of a stack. After a few minutes of this, he uses a metal tool that looks like an L-​shaped paint scraper to pry the top super free and prop it on its side. Then he cranks on a leaf-​blower, to direct air up through the bottom. From the other end, Jill reaches inside with a brush to swipe away bees that have withstood the smoke. With the super on its side, I can see wooden slats that have been inserted vertically, like VHS tapes—​these are called frames, Jill tells me. On each frame are mounds of honeycomb. When Barry is satisfied the bees are gone, he lifts the super onto a hand trolley, and then he moves on to smoking another. At one point Jill hands a frame out to me to hold. I’m startled by how heavy it is. “Each super is sixty pounds,” she tells me, and holds ten or twelve frames. Soon the air downwind of the hives is teeming, the bees swooping and buzzing erratically. When the wind ebbs I can feel the air around me vibrating. By the sixth super, bees are whizzing over to my side of the stacks, and one dives repeatedly into the mesh lens of my head cover. Suddenly I’m very thankful for the protective gear Jill offered, poorly sized and all. Barry and Jill are wearing thick gloves, but I don’t have any, so I slip my fingers inside the sleeves of my jacket. I’m not scared of bees, but—​well, in this situation, I’m scared of bees. For the first twenty minutes of this, Barry doesn’t acknowledge me at all. I wish I hadn’t begun the visit by driving the wrong way around the field, and I try to make up for it by anticipating where I should move and stepping out of his way any time he turns around. Gradually, Jill explains the specifics of what they’re doing, and when I follow up with her Barry speaks up to provide some answers. Honey production, it turns out, is a risky business. In a superlative year, Barry and Jill can collect up to 30,000 pounds, but it is also possible, if conditions are all wrong, not to make an ounce. Adult bees consume honey; what beekeepers pull from the hive is excess, so it isn’t guaranteed. If the bees haven’t formed more honey than they need for themselves or, worse, haven’t produced enough, a beekeeper must leave it in the hive or risk starving the colony. The reminder of these uncompromising challenges, or else the smothering heat of the day, causes Barry’s mood to swing a few times. One moment he seems like an avuncular mentor, the next he is agitated. “I can’t talk right now,” he growls at one point when I try to ask him a question. Another time he snaps at Jill, who has set his tools in the back of his truck in a way that displeases him. “These need to be cleaned tonight,” he demands. Aside from his imposing interpersonal style, another thing I realize in talking to Barry is that I didn’t expect such formal education in a beekeeper. Suddenly I’m embarrassed by this expectation. I worry he recognized this about me before even I did, and guilt tugs at me each time he says something academic. “It’s a bilateral brain function,” he says once, explaining why he thinks so many hobbyist beekeepers struggle to learn. “You have to think intuitively and deductively simultaneously.” A minute later: “They exhibit a very high level of auto-​sensate behavior.” Then he rushes through a theory he has about instinctive predispositions for and against working with nature. “That’s an emerging field of psychological study,” he tells me. After nearly three hours of checking frames, hauling supers onto the trolley, and pushing them to the trailer, Barry pulls Gatorades and water from a cooler and leans against his truck to rest. He asks me if I’ll be talking with anyone else, and I tell him my plan to attend a hobby beekeepers’ meeting and hear what they have to say. He nods approvingly, as though he agrees this is the responsible thing to do, but when I tell him the meeting I’m going to is the one in New Hanover County, he rolls his eyes and lifts his arms as though to shield himself. “Don’t go there,” he nearly shouts: “We’ll have to disinfect you.” New Hanover’s is a breakaway group, he explains, begun when people defected from his own club in Cape Fear. 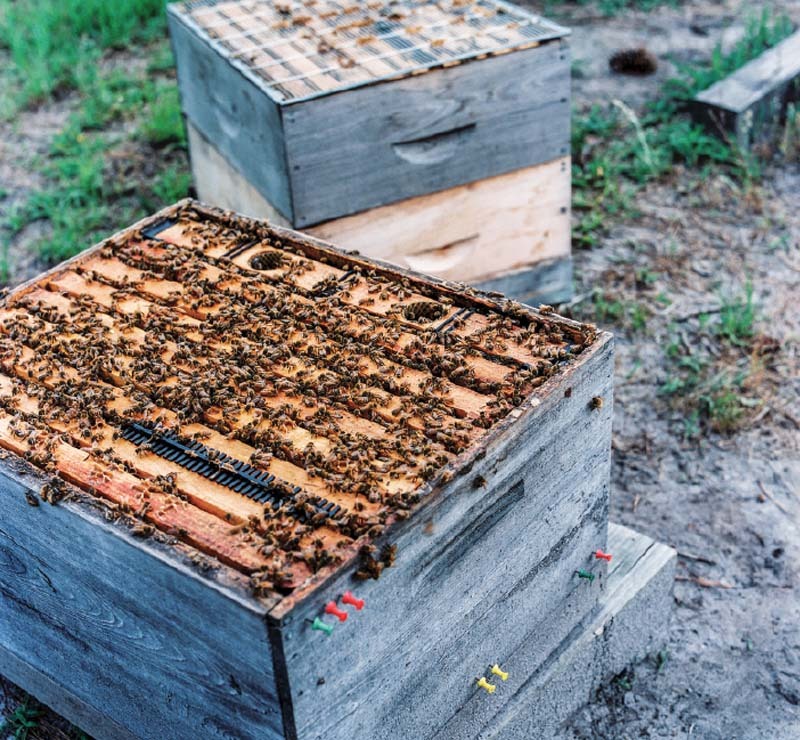 At Cape Fear, he tells me, they care about the bees, and that’s what they talk about. At New Hanover they just get together and socialize. They decamped after “people who killed their bees got their feelings hurt,” he says when I ask about the split. I shouldn’t go to their meeting. I should go to his. 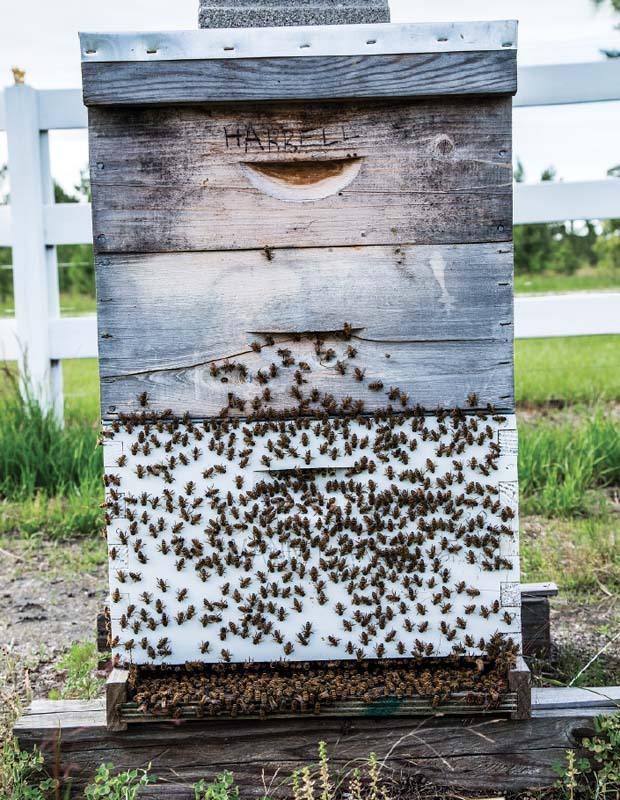 The New Hanover County Beekeepers Association meets on the third Thursday of each month, in a large lecture room at the local arboretum on Oleander Drive. At the August meeting are thirty or so people, mostly affable fifty-​ and sixty-​year-​olds with heavy drawls, though one couple looks to be in their early thirties. Scattered atop tables are leftover paper plates and watermelon rinds. Today a guest speaker, Dr. John Ambrose, has come down from North Carolina State University, where he’s been part of the apiculture program for nearly forty years. Before the meeting, there was a potluck dinner. The first matter of business when the meeting is brought to order with a gavel is to encourage folks to take home some of the leftover food. The second is to congratulate David, who at the July state meeting “got a blue ribbon for his wax.” Then there’s a request for someone to speak to a local second-​grade class about bees, followed by an informal survey of how many people in the room have found wax worms in their hives, which are evidently causing lots of trouble this season. Then Dr. Ambrose is introduced. He’s here to talk about honey. Unlike other raw agricultural products, such as milk or peanut butter, Ambrose says there is no standard definition for honey. No license, or even a label, is required to sell it, as long as the revenue is under $50,000. As far back as 1975, the Food and Drug Administration expressed interest in establishing a national honey standard enforceable by law, but it never followed through. In the United States, we eat two-​and-​a-​half times as much honey as we produce domestically, which means the difference is either imported from sources abroad, whose quality is unverified, or, worse, isn’t entirely honey: It’s diluted with water, or corn syrup, and dishonestly labeled. Sometimes its flower source is disguised to seem more exotic or delicious. Sometimes it is marketed as organic, which everyone in the room agrees doesn’t exist, unless you can prevent every bee from visiting any plant treated by pesticides, which everyone agrees you can’t. 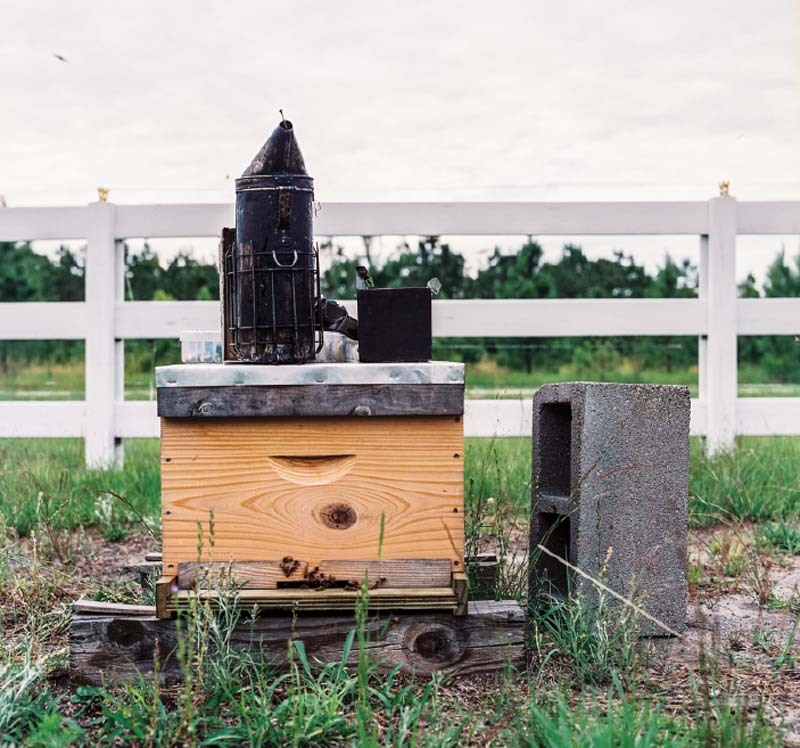 In response, bee-​keeping associations in Florida and North Carolina recently collaborated on minimum allowable criteria for honey sold at market. The hope is to prefigure a national standard, and that the FDA, observing such a thing is possible, will take on this responsibility itself. In July 2012 the North Carolina Beekeepers Association adopted a certification process whereby honey producers, in exchange for pledging their honey is the real thing, may affix to their jars yellow labels with a picture of a honey bee as large as the state outline it overlays. The system isn’t perfect, Ambrose admits. First, it’s reactive, not preventative: Honey will be tested only in the event of complaints, not in order to use stickers in the first place. Second, uncertified honey can be excluded only from state-​run farmers’ markets, not from local markets or roadside stands, since this is only a community rather than legal standard. Third, some criteria, like whether honey is heated before it is packaged, was too vexed for both states to reach a consensus, so it won’t be monitored at all. But the hope is that, despite these limitations, consumers will prefer certified honey, and yellow stickers will discourage adulterators, who risk public exposure. Nearly everyone at the meeting seems to approve. One elderly man expresses concern that the water content of his own honey disqualifies him from the adopted standard, though he insists he hasn’t intentionally over-​hydrated. A woman worries that duplicitous honey producers, even if they are found, will easily regain certification without making more than provisional changes to their honey. Otherwise the group seems pleased and wants to know when the stickers will be ready. I’m not sure what I expected after speaking with Barry, but these hobbyists seem interested in learning, and it’s hard to imagine them gleefully murdering bees. At one point David, the blue-​ribbon winner who is evidently a licensed master beekeeper, one rung below master craftsman, asks the others if they would be interested in him offering a more advanced bee-​keeping course “to move people along.” A third of the room raise their hands. When the meeting breaks up, I say hello to a woman at the table in front of me, who has stayed put as others are packing up to leave. I want to test Barry’s prediction that hobbyists don’t know people like him exist. So I ask: Are there any commercial beekeepers in the area? The woman thinks, her eyes swinging up toward the ceiling. “I don’t know that there are,” she says. “I think there’s one up in Raleigh.” Then she calls to someone she says will know better, and two men walk over, one much taller than the other. “He’s asking if there are any commercial beekeepers around here,” she tells them. “I don’t think so,” the shorter man says, and the three shift uncomfortably. “There’s a guy we know we wouldn’t send you to,” he explains. “His name is Barry Harris. 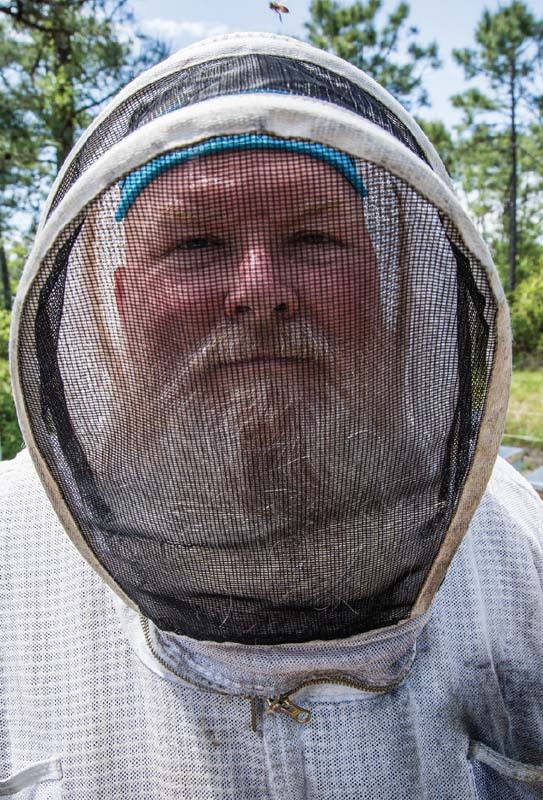 He runs the Cape Fear beekeepers’ club. This one is a swarm from that one.” He smiles at his word choice. The woman laughs. “You’ll understand as soon as you see him,” she tells me. When Barry marches into the Cape Fear Regional Beekeepers Association meeting a few days later, he carries not a yellow legal pad but a briefcase and soda cup from Hardee’s. He wears the same boots and pants as at the bee yard, with matching army fatigue suspenders over a gray sweat-​stained T-​shirt. We’re in a wooden barn at Poplar Grove, an old peanut plantation alongside the loping Blue Star Memorial Highway, just over the border into Pender County. Nearly two dozen people are here, mostly individual men instead of the married couples I saw at New Hanover. I count only six women. Only two people in the room look to be younger than fifty, and everyone is dispersed thinly around the room. Their voices are soft until Barry walks in, when they seem to perk up. He makes amiable small talk as he turns on the room’s large-​screen television, which feels out of place in an old barn, and pulls a laptop from his briefcase. The business portion of the meeting, as Barry calls it, is brief: Whoever usually records minutes isn’t here today, which means they can’t review their discussion from last month, and Barry doesn’t have any new business. One woman raises her hand to share a notice she saw in the newspaper that the state is set to begin spraying for mosquitoes tomorrow. Several people ask nervously how this will affect their bees, which Barry says is hard to predict. He knows a beekeeper whose property was hit directly one year, and the spray “killed nineteen of his twenty colonies stone dead.” But without a direct hit this is unlikely. Homeowners may request their property not be sprayed at all, though sometimes the state ignores such requests for its own convenience. Barry tells the room he will make a call and let them know. Then he asks if there’s a motion to close the business portion of the meeting, and a second. Today’s meeting is devoted mainly to the results of a yearlong study Barry completed recently with David Tarpy, a nationally known entomologist, which was funded partly by the USDA’s Sustainable Agriculture Research and Education program, though more funding came from Mann Lake Ltd., one of the largest bee-​keeping supply manufacturers in the country, and when that still wasn’t enough, Barry robbed from his own retirement fund. He has a PowerPoint presentation cued up on his laptop, titled “Effect of Liquid Bee Feed Type on Colony Growth & Survival.” He asks a woman if she’ll sit at the laptop and click through slides as he lectures. It’s true that, in the poorly lit barn, some of this learning is joyless, alienated from what would conceivably make a person care about bees in the first place. The goals for being here all seem noble: that these people love bees, intend to collaborate with nature, feel better about themselves in the same way vegetarians do. But I bet these dusty-​aired lectures can feel a lot like checking off curricular requirements. One issue does catch my attention. Explaining the chemical differences between sugar compounds, Barry mentions sourwood honey, which he says the state hobby beekeepers’ association is fixated on because so much of it is adulterated. Sure enough, I recognize this from Dr. Ambrose’s talk at the New Hanover meeting. These people claim they will monitor adulterated honey through testing, Barry says. He shakes his head scornfully. “The problem with that,” he continues, “is they are so similar chemically, that’s harder to do than they would like you to believe.” Immediately I wonder what Ambrose would say to this. I find myself wishing Barry was at the New Hanover meeting, and had spoken up—​that he and Ambrose could have a discussion, each arrived at his respective position through sincere empirical inquiry, and the rest of us, eager to learn, could be there. I head to my car considering the visible fault lines between Barry’s philosophy and the culture at New Hanover. It’s easy to see the components of Barry’s personality that could strain collaboration, but this doesn’t seem like the entire picture. Uneven social interaction is one thing. But Barry’s point about monitoring adulterated honey suggests that even where science is concerned, interpretations vary, and their interpreters can be testy. Still, despite his coarse edges, Barry doesn’t seem to me like a hostile authoritarian. Here he is, four weeks behind schedule, using his time to teach others. Little appears to be in it for him. I ask Barry about this a few days later at Hardee’s, a place he describes half-​jokingly as his second office. Other than stylistically, Cape Fear and New Hanover don’t seem so far apart; they both seem interested in learning the same things. I understand he probably isn’t interested in this, but just theoretically, what would need to happen for the two groups to rejoin? “But their livelihood depends on them doing that successfully,” I tell him. “Wanting to live more symbiotically or collaboratively with nature seems like a positive thing,” I suggest. But you could’ve chosen lots of things, I tell him. Surely there is something specific to bees he feels intimate about. He chose bees for a reason. He shakes his head. “I didn’t choose that,” he denies. “You don’t choose your destiny. Your destiny finds you.” When he was sick, Barry says, he started doing what he calls “bucket-​list-​type stuff.” He began hunting “because it was something I always wanted to do and never had time, because I worked eighty, a hundred hours a week in the insurance business. 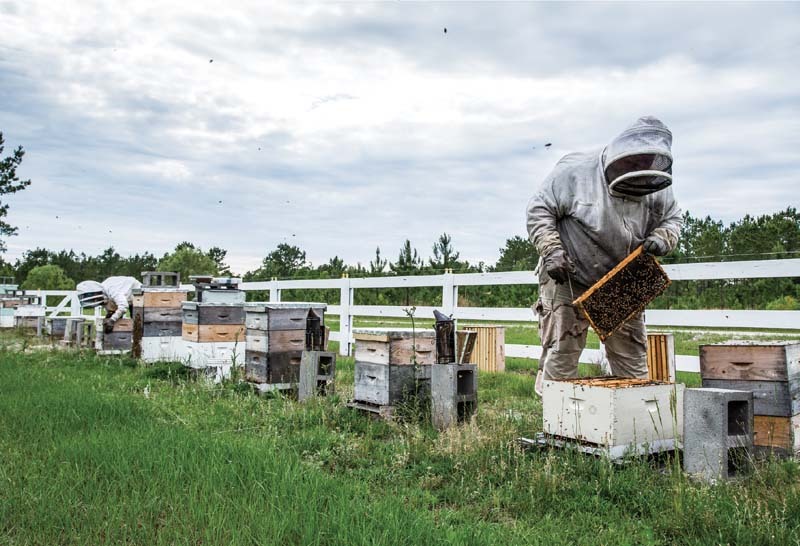 And we planted a bunch of clover fields for the deer, and we found out we needed bees for the clover, and so I got a couple colonies.” But taking care of bees proved more complicated than he planned. “So I said, I need to either get in this or get out of it. Then I took it seriously, and started trying to learn about it.” He thought when he convalesced he would return to insurance, and keep a part-​time bee-​keeping business on the side. It turned out, though, he couldn’t get his head back into insurance, and by then he had bees and equipment. 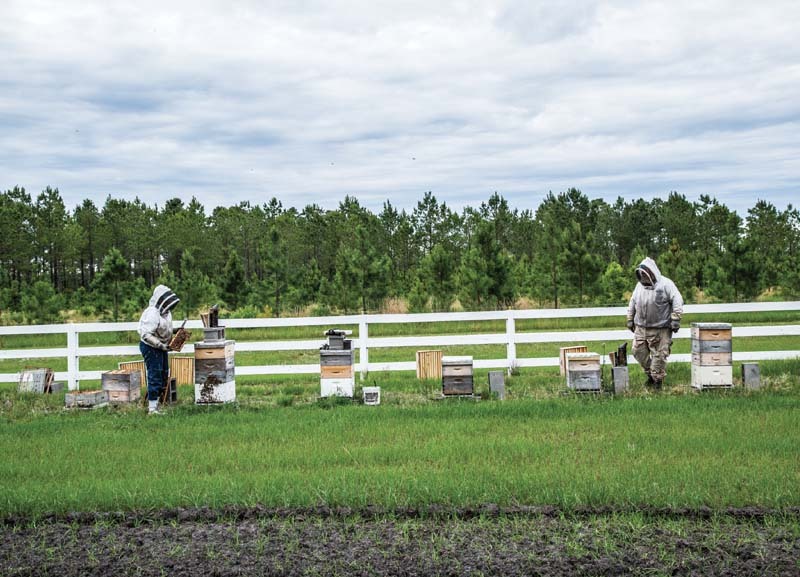 “So the way the river went for us,” he says, “was getting into bee-​keeping.” In those days hobby bee-​keeping was virtually unheard of in New Hanover or Pender County, and Barry couldn’t sell to people who didn’t exist. “So we had to create hobby beekeepers,” he tells me. “So we started running a bee-​keeping school. The first school we ran, I think we had one hundred thirty-​five people.” Then the clubs in New Hanover and Pender County broke away. I ask him about the answer to his question from the other day. Where have all the beekeepers gone? Why is the field disappearing? “Because it’s hard,” he tells me. 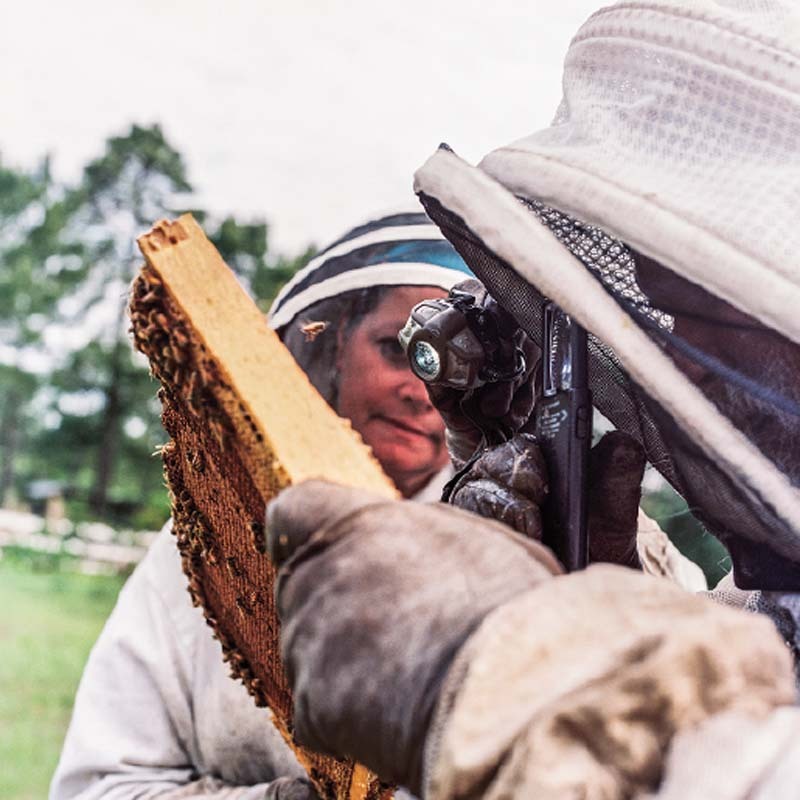 “It’s long.” Most commercial beekeepers work sixteen-​ to eighteen-​hour days. To start up is extremely capital-​intensive. And the regulatory bureaucracy is designed to benefit hobbyists, not the people who keep bees for a living. By its own language, for example, the North Carolina Bee and Honey Act, which entitled the local Board of Agriculture to regulate bee-​keeping statewide, was intended to “enhance the bee and honey industry in North Carolina particularly relative to small beekeepers.” The same legislation established fees for “inspections, issuance of certificates, permits, registrations, and regulatory activities,” all of which are borne disproportionately by those who keep bees commercially. 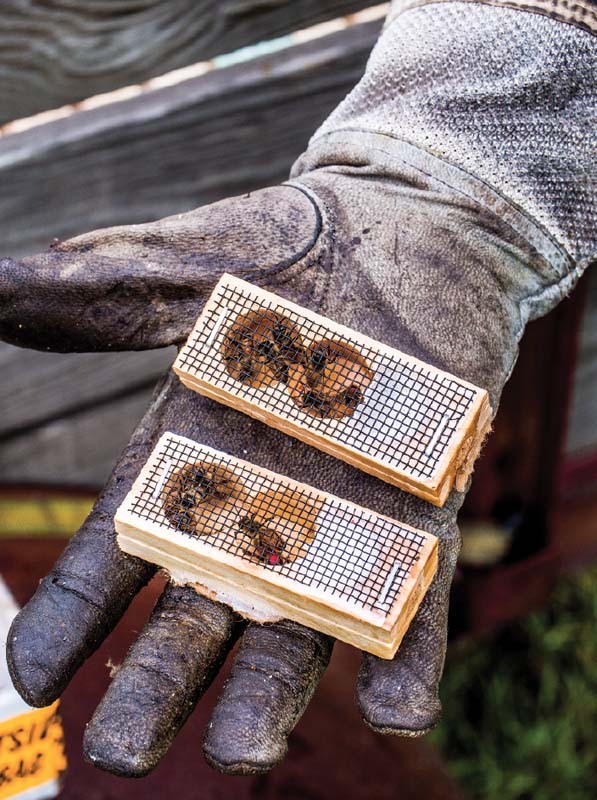 There are consequences to policies like these, Barry points out: Every year, pollination demand in North Carolina exceeds the number of commercial beekeepers locally, so as many as two-​thirds of the pollination hives come in from out of state, which is a risk factor for the import of diseases. But everyone knows someone who’s a hobby beekeeper, and they don’t realize that guy they know doesn’t have anything to do with pollination, or probably honey, either. So everyone assumes beekeepers are thriving. “What percentage of the Cape Fear people do you think stick with your prescriptions?” I ask him. Barry shrugs. “I’d say probably eighty percent of them do eighty percent of what we tell them to do,” he says. “And they have a high survival rate as a result.” But for many others, he says, bee-​keeping is like a religion. People don’t want to hear anything that doesn’t fit their preexisting narrative. I consider all the deficient practices Barry has described in hobby bee-​keeping. What if I had a big garden on my property, I ask him, and wanted a couple of hives to help pollinate. If I was responsible about learning how to do it, is there anything wrong about that for him? I leave Barry in the rain in the Hardee’s parking lot at at nearly ten at night. He’s headed to his shop, where he’ll be awake for several more hours putting equipment in the freezer. It’s an early night for him, he tells me, climbing into his truck. I don’t feel any closer to the truth behind the honey I purchased at the farmers’ market weeks ago. After leaving my message, I never heard back. I still don’t know if Wildflower Julie is a real person, or if the honey she sells really is pure and natural. Maybe it’s corn syrup, or diluted with water. Maybe it’s local, or imported from Argentina. Though I imagined it healthy and responsible, possibly it is neither. I didn’t envision in bee-​keeping a landscape partitioned as strictly as athletic fields. The conflict I imagined ecological was, in fact, as man-​made as buildings. The questions I’d come for didn’t match the answers I found. Barry would be glad I let go of what I was holding on to. Still, there are downsides to this, too, which he didn’t mention. I don’t even know anymore what to put in my tea. And I can’t help but think we would all be better off—​the bees, their caretakers, and their customers, who turn out to be all of us—​if Barry and the hobbyists could work out some agreement, or if their respective listeners could; if Barry saw the others as genuine learners, or if they could really be that way; if the hobbyists could see Barry as I do tonight—​alone in his truck, and forever on his way to work, rumbling through the rain. Benjamin Rachlin is an MFA candidate in creative nonfiction at the University of North Carolina Wilmington, and a writer for the university’s research and arts and sciences magazines. He studied English at Bowdoin College, where in 2008 he won the Mary B. Sinkinson Prize for Best Short Story. Peter Frank Edwards is a photographer from coastal South Carolina. He has photographed for publications including the New York Times, Time, and Food & Wine, and clients such as American Express and UPS. the question to ask yourself is this: why is there a movement for hobby beekeepers in the first place? commercial beekeepers had their chance, and they ruined it by making their decisions based on commerce, not the health of the bee. there were almost no hobby beekeepers 10-20 years ago, and that's precisely when all these problems we have today were allowed to gestate and become manifest. hobby beekeepers don't care as much if their bees die because their paycheck doesn't rely on it. they are more open to experimentation and can tolerate failure or colony death. a commercial guy? not so much. now is not the time to be rigid in mindset, we need to figure out what the best solution is moving forward. bees have thrived for several thousands of years without humans dumping chemicals into the colony to "keep them alive". colonies die all the time in nature. treating for mites? if they would have let the bees die that were susceptible to mites, we wouldn't have a mite issue today. Very interesting story and pics are great - much appreciated. 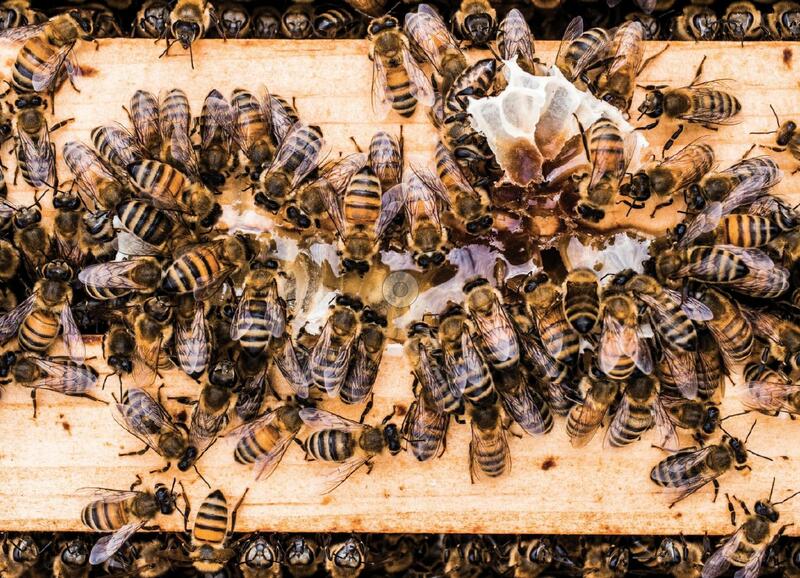 Very interesting article on bees and the social interaction of a diverse human population. Thanks.